With AluFab aluminum structural framing, you can build just about anything you can imagine. This includes perimeter guarding, work tables, machine bases, industrial guarding, tool racks, robot stands, workstations, carts, display units and much more. AluFab offers the broadest line of aluminum profiles, connectors and accessories. This means we can customize your structure so that it functions exactly the way you want, and it can be built to support any load. Check out some of the applications we specialize in below, or Contact us for more information. AluFab specializes in custom enclosures, ranging from small cabinet enclosures to walk-in enclosures the size of an entire room. Enclosures can include features such as electrical power, heating and cooling, safety sprinkler systems and custom lighting. Because T-slotted extrusions are so flexible, customizing your enclosures becomes easy. Because of the design flexibility and ability to carry heavy loads while remaining lightweight, T-slotted extrusion is the perfect choice for your machine bases. With T-slotted extrusion, assembly, retrofits and the anodized finish save you valuable time and money. Lightweight, anodized finish and ease of modification makes your choice for framing material easy. Many people prefer t-slotted aluminum extrusion over steel framing because with extrusion, there is no welding, grinding or painting, and installation is quick and easy. You can mount absolutely anything to T-slotted extrusion, making AluFab’s extrusion the perfect choice for your machine frames. Modular, ergonomic and adjustable, work stations can be easily designed and modified to fit your application. Lights, manifolds, table height adjustments, tool hangers, parts bin racks, and power outlets are just a few features that can be added to any workstation. Also, because of the design flexibility of extrusion AluFab workstations never become outdated. 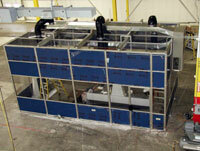 The AluFab team can help you re-design, add to, or modify your existing workstation to meet any new demands. 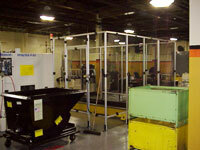 Worries of OSHA are a thing of the past with AluFab’s guarding. Enhance the appearance of your machines while adding the safety features that will keep you in compliance with all OSHA regulations. Let AluFab’s designers and installers take care of all of your guarding needs from start to finish. Safety interlocks, sliding or latching doors, and tool racks are just some of the features that can complete your perimeter guarding. 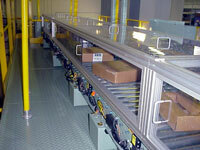 Electronics, fluid power, packaging and guarding can all be easily incorporated into your material handling systems using the T-slotted extrusion technology. A ball end Allen wrench is the only tool required to add flexibility and modularity to your material handling systems. The sky is the limit for your tooling applications. 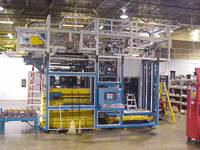 Tool carts, racks, and shelves are all easily designed and assembled using t-slotted extrusion. The lightweight properties of extrusion makes any assembly easy to handle, and the flexibility of T-slots makes your design easy to assemble, move, add to, or redesign. AluFab’s T-slotted extrusion allows for infinite adjustment and modularity for all of your special tooling needs. 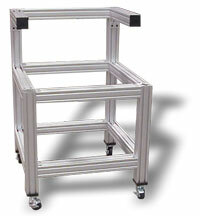 Lightweight modular exhibits are easy to ship and can be assembled on site with a few turns of a ball end Allen wrench. Permanent or temporary displays are easy to configure and customize. 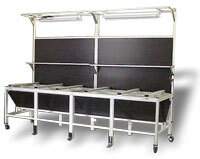 AluFab can help design a display that will fold up, lock together and roll into the back of a truck or van in minutes. AluFab can design furniture that is modular, ergonomic and adjustable. A large variety of aluminum extrusion profiles allows us to design and build anything from small stands and trays to large desks, cabinets or entertainment centers. Many stores, offices and homes have already enjoyed the unique appearance and quality of AluFab’s custom furniture. Power transmission, electronics, fluid power, guarding and customer assemblies; anything bolts to the T-slots making your automation systems versatile and efficient. From small prototypes to entire automated systems, everything can be designed and created with t-slotted aluminum extrusion. Metric and fractional T-slotted extrusion allow for smooth and reliable linear motion that can be used in virtually any application. Our wide variety of bearings, slides and brakes makes AluFab your first choice for your linear motion applications. Valves, actuators, regulators, fittings, pumps, and accessories easily attach to AluFab’s T-slots. Alufab’s T-slotted profiles make cleaning up your fluid power system easy. The T-slotted profiles can be used as pressure manifolds and tube and wire-ways to improve the aesthetics and function of your fluid power system. Contact Us if you have an idea that fits any of these descriptions, or if you have a unique idea that you would like to see built. Also, check out our Unique Creations page to see some examples of custom projects we’ve been able to complete for customers. To request a quote, printed literature or make general comments fill out the form below. AluFab does not sell contact information to any third parties.